Ohhhh! What a fab gift Aimes! So excited for you! Your pic is so bright and bold! Your card is fantastic, such a great representation of the pic. Love it! hello cutie pie card and wooo hooo on the tent!!!!!! oh, score on the photo tent!!! Woohoo!! And your first card with it is stunning...way to break it in! I just find it so freeing to be ablel to take pics on any kind of day at any time :) Tell Chris I'm very impressed!! Love reading about your inspiration...you really studied that photo and picked out the most lovely details :) I thought you had Boxing Day too, in fact, being your younger cousin, I should have mentioned we probably got the holiday idea from you. Now we just need to give you Thanksgiving Day so you can have another long weekend :) The turkey bun sounds yummy...that's what we've been eating for lunch this week too...might whip up a turkey curry dish too this week :) Hugs, Duchess!! 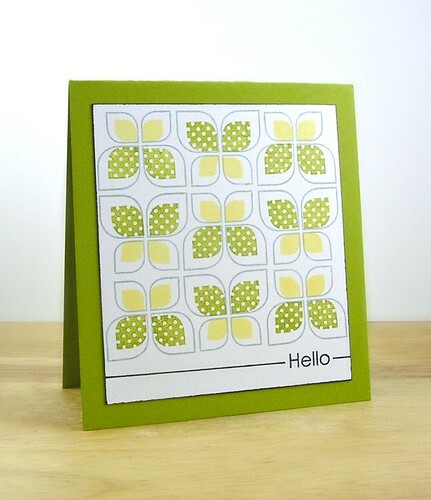 beautiful and modern inspired card. Love the green and yellow repeated patterns. I would also like to know the photo tent you use. YAY photo tent! Awesome photo with the new tent! Of course, with INCREDIBLE subject matter like this fabulous card, you're bound to have a photography masterpiece! Wheee, I've been missing ... not just from the scene but the inspiration on your blog! Wowzers Aimes, Modern Basics was *made* for you - I LOVE what you're doing with this set! Your take on this pic is totally fabby - (and I'm so happy for you on the light tent!) I don't have hyoooge amount of helpful advice, but remember that Carly Robertson had a helpful post about them and simple photo editing a while ago! Oh my Aimes...gorgeous! I love the repeated bold/modern pattern, and the simple sentiment. Fab photo too...congrats on the light tent! Thanks for playing along with the Runway Inspired Challenge! You always wow me with modern basics! I would love to see your photo set up! Looks amazing! Oh now my resolution is to get a photo tent for sure, Amy! Your card is brilliantly bright now :)! Love how you used Modern Basics to make such a fab pattern...beautiful colors! You rocked this challenge, Aimes. 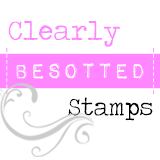 I really love the way the modern basics stamps echo the perforated bag. I want it in my closet too. A great card to show off those stunning colours. 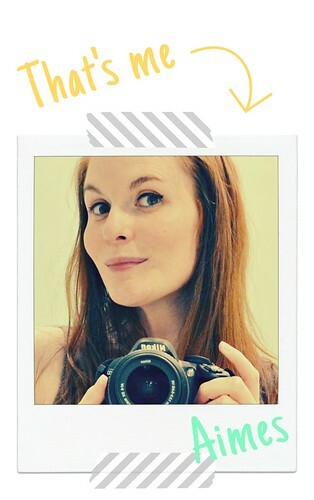 Yay... a photo tent :) Your gorgeous cards so deserve the right spotlight! !